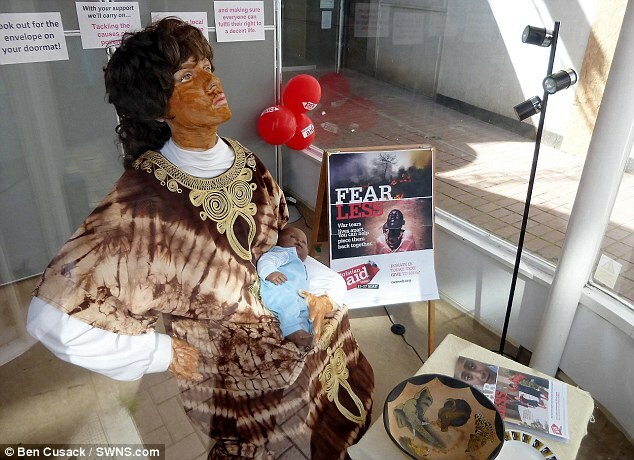 A church was criticized today over a display promoting Christian Aid Week using a mannequin that had been ‘blacked up’. The window scene features a white tailor’s dummy covered in brown paint to make her look ‘African’. Onlookers were stunned to see a lady putting a white mannequin in the window – then start to paint the skin. 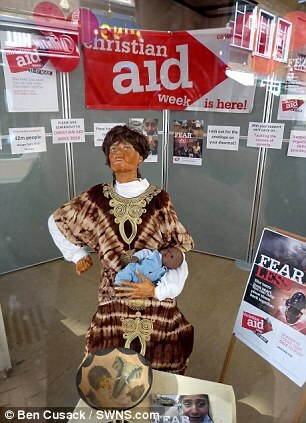 The mannequin, which is also holding a black baby and wearing a traditional costume, was installed at the Maidstone United Reformed Church in Maidstone, Kent. 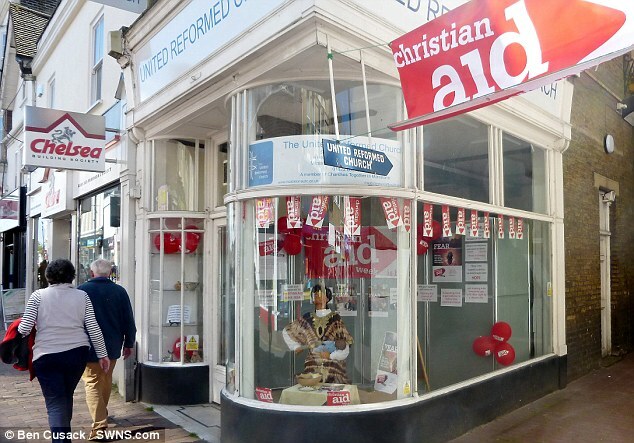 But the display – being used to promote Christian Aid week – caused quite a stir in the town. One witness said: ‘I saw a woman putting it together on Friday lunchtime. She seemed like a normal, nice, well-meaning lady. ‘But then when I came back from getting a sandwich I saw her stood there painting this white mannequin with varnish. ‘I couldn’t believe it – it’s so inappropriate. I can’t believe anybody would think that’s a good idea in this day and age. Charlotte Jacks, 28, of Goudhurst, Kent, has a four-and-a-half-year-old daughter of mixed race. Thousands of shoppers walked past the figure from the time it was installed on Friday afternoon until it was taken down this morning. Reverend Andrew Royal, the minister of the church, said: ‘I would like to apologise on behalf of Maidstone United Reformed Church for any offence caused by the church window display that was put up for Christian Aid week. Christian Aid Week is an annual charitable event which takes place in the second week of May, run by a collective of different churches nationwide. Last year, 20,000 churches raised £12million, which was used to help less-fortunate people all over the world, including Africa. Christian Aid works with more than 700 local organisations across 50 developing countries on a range of issues in a bid to improve their lives It runs until Saturday.